Another case of Goblet cell carcinoid, Group B (Adenocarcinoma ex GCC, signet ring-cell type). 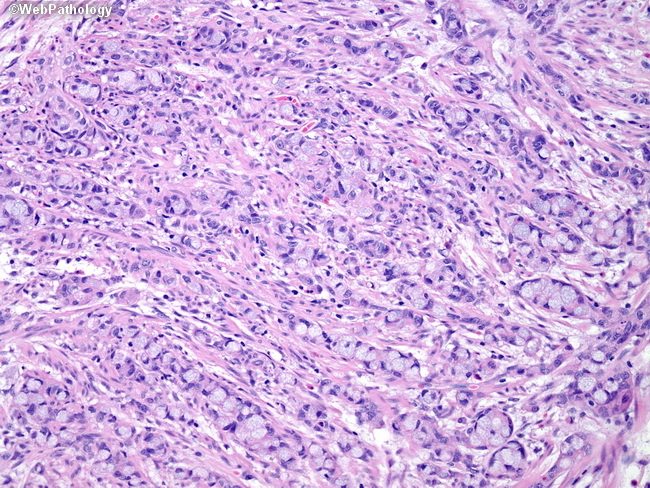 The image shows tumor cells with predominant signet ring cell features discohesively infiltrating the muscular wall in the left half of the image. The tumor in the right half of the image has some resemblance to GCC, type A, with partial preservation of goblet cell clusters. The tumor cells have hyperchromatic nuclei with moderate to severe cytologic atypia.